Mariana Carrizo has a unique singing style inspired by the Andean tradition. She mixes ancestral root music with other genres like jazz, classical and other kinds of root music of the world. Raised by her grandmother, a shepherdess from the Andean region of Argentina, she received the ancestral wisdom that today gives texture to her singing. She sings and performs in festivals and productions mainly in USA, Spain, Portugal, Mexico and in all Latin America. 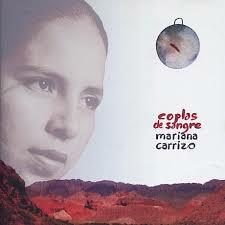 Mariana Carrizo is often invited to perform along and record discography work with and by famous artists from all over the world like: Dulce Pontes, Illapu, Luis Salinas, Leon Gieco, Peteco Carabajal, Dino Saluzzi, Pancho Cabral, Leo Genovese, Chaqueño Palavecino, Duo Coplanacu, Trio MJC, among others. In 2004, Mariana Carrizo was awarded the Consecration Prize at the Cosquin Folk Festival, Argentina's most prestigious folklore festival. Since then he continues to reap prizes, and dazzling with his live show through tours around the world. - TOPAMIENTO DEL CANTO MADRE / Documentary, for the International Indigenous Film Festival, Ixmiquilpan, México. “Coplas de sangre” 2008 (DBN Argentina), “Libre y Dueña” 2004, “Coplas y Bagualas” 1996. She is currently recording her next album with famous world music artists. Mariana Carrizo: voice, tinya doble drums, chayera drum. Chino Carrillo y Daniel D’Amico: zamponas, erke, toyos, andean wind instruments. Chumy Cardoso: Guitar criolla, Charango, string instruments. Mariana Carrizo & group (4 musicians).